Our final week on Farquhar during 2015 season brought with it a superb group of people courtesy of our good friends at the Fly Shop http://www.flyshop.com. The group included John Kosinski, John Le Claire, Richard Clark, Tony Schopf, Tola Chin, Doug McLean Grace, Rich Hohne the Marketing Director for Simms http://www.simmsfishing.com and finally tour leader Ross Purnell, editor of The Fly Fisherman magazine http://www.flyfisherman.com. We were blessed with superb weather throughout the week, clear skies with moderate winds allowing for some exciting sight fishing on Farquhar’s flats. The last week of the season turned out to be a special one for our Bonefish enthusiasts and set the tone for the fishing in general for week. The first day of the week saw guide Justin Rollingson put his guests Tony & Doug i_nto multiple fish, the biggest being a fish of 10lb landed by Tony who was both humbled and ecstatic by the fish and the experience. 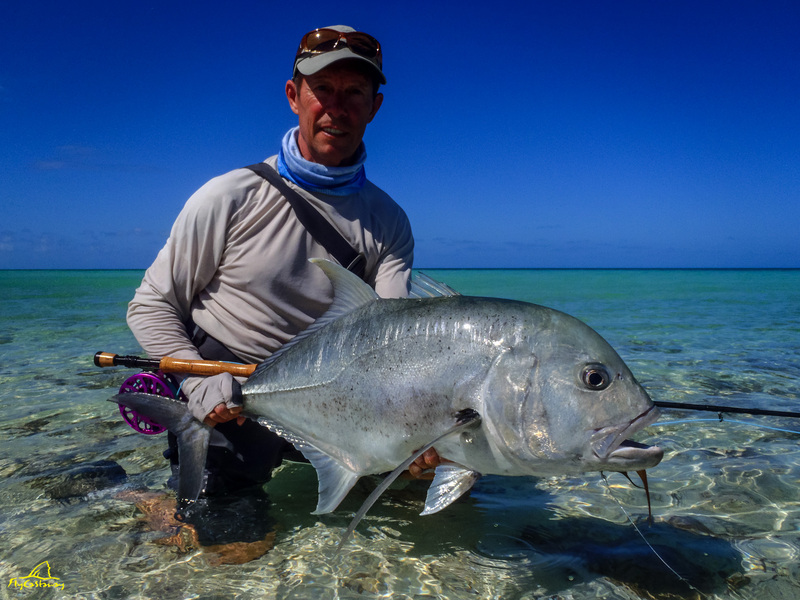 The GTs were out and about this week with a good number of fish spotted on the flats. Tola Chin landed the first GT of the week with a fish of 80cm on the first day. 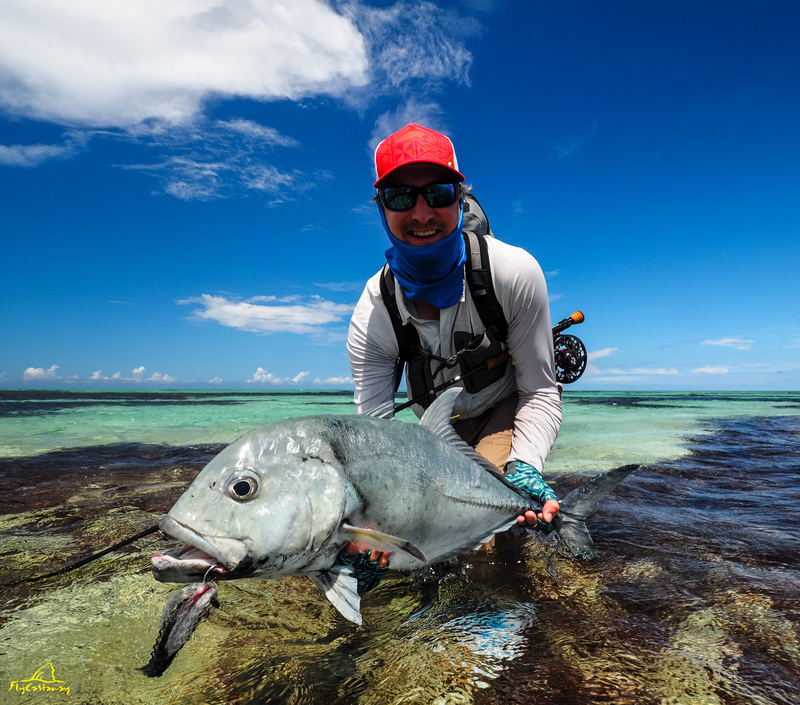 Richard Hohne landed 3 GT’s, his biggest being a fish of 82cm which was landed after fearlessly approaching a pair of large Lemon Sharks who were feeding in the middle of the flat. Rich made a fantastic cast and with a few fast strips a GT rushed out from behind the sharks to inhale the 6/0 GT Brush Fly. He set the hook and held on while the fish tore into his backing. After a hard fight the fish was landed, photographed and released! The largest GT landed on our last week of operation for 2015 was a fish of 91cm, hooked and landed by Doug who was thrilled by the experience. A total of 11 GT’s were landed for the week. As for the other Trevally species on offer, the Bluefin Trevally provided great sport for our anglers with a handful landed everyday of week 8. A single monster Golden Trevally was landed during the trip, John Le Claire with an awesome fish of 83cm that he hooked and landed on an 8wt. Well done John! The Bumpies were seen tailing on multiple flats throughout the trip. A fish species that keeps both guides and guests enthralled, at times we were challenged without answer. That being said, three lucky anglers managed to experience the thrill of hooking and landing the incredible Bumphead Parrotfish. Ross Purnell & Richard Clark each landed their first ever Bumpies on fly, however a special mention must go out to John Le Claire who hooked and landed an incredible fish of 119 cm. 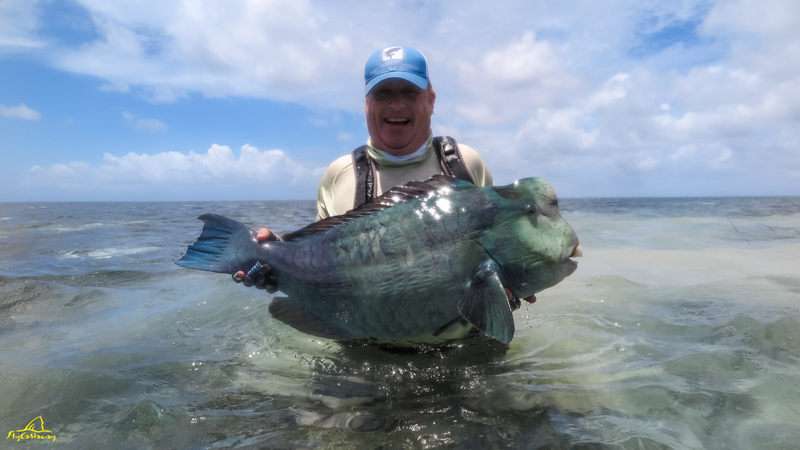 Any Bumpie is a trophy, but a fish of 119 cm is an absolute monster! Not only did John land the biggest Bumpie this week but he bagged the first Bumpie Slam on Farquhar for our 2015/2016 season. 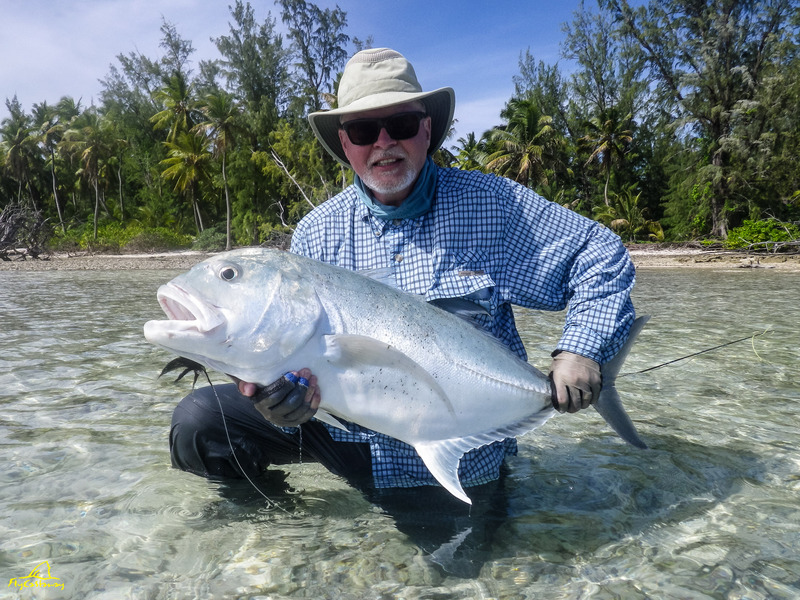 A GT, Bumpie and Bonefish all landed in one day, an incredible feat and a super special day for both Head Guide Matt Cosson & himself. The Sailfish were still around, with a fair few fish raised to the boat. Unfortunately the only fish hooked did not come to hand after it threw the hook with a series of acrobatic displays. Our “Bombie Bashing” produced some fantastic fishing, with huge Grouper landed on fly this week. These fish that are filled with color are dogged fighters who power straight back to their hole in the coral once hooked. One has to hold on and not give an inch if you’re going to pull him away…such awesome fun! Richard Clark and Tola Chin experienced this first hand and landed some serious specimens. Tola didn’t waste time racking up his species count, bagging a good sized Yellow-Margin Trigger as well as an awesome Giant Triggerfish. Both fish fell to fantastic casts whilst tailing in super skinny water. It was a joy to watch! 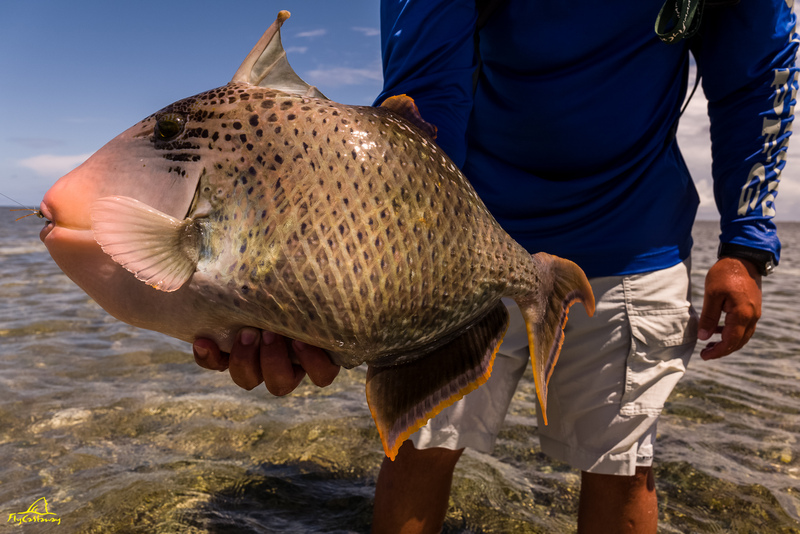 And so our final week of the season proved to be an exceptional one, with GT’s, Bumpies, Triggerfish, Golden Trevally, large Bonefish, big Grouper & many other species of sporting fish landed on the fly. All in all an incredible week, one thoroughly enjoyed by our guests as well as our guides. Just a comment on the Golden I caught. It hauled over 200 yds. of backing off the reel when it became embedded near the barrel. Nick and I had to hustle in shoulder deep water to gain line. We finally did it and landed that beautiful fish. The bumpie was even more of a challenge. It dragged me a good 400 meters to the edge of the flat and pulled me off with the outgoing tide. Matt was swimming and diving underwater pushing me back onto the flat where we finally landed it in neck deep water after a very exhausting hour. I also had to send my riptide in for service. I don’t think even salt water reels are meant to fight a hard fish underwater.